George North gave a try-scoring master-class as he crossed the whitewash no less than four times during Northampton’s 34-6 win over the Ospreys in round two of the European Champions Cup. The first of his tries came 16 minutes into this Pool Five encounter when Stephen Myler found him with a long pass, after a great turnover instigated by ferocious work at a ruck from Lee Dickson. On the half-hour Ken Pisi ripped through the Ospreys defence from his own half to set North up for the second try, though North still had a man to beat. The Welsh wing barged past two tacklers to secure his hat-trick after 54 minutes and the fourth was a brilliant individual score, as North stripped the ball out of Ospreys hands on halfway, kicked ahead down the left and slid over to touch down, under pressure from three opponents. The Ospreys had been unbeaten in all competitions this season until this trip to Franklin’s Gardens, but could do nothing to quash the brilliance of North as he equalled the Northampton club record for tries in a match set by Paul Diggin four seasons ago. Want to see more of North at his best? Take a look at this. Leinster centre Ian Madigan kicked seven penalties to take his team to a valuable away win in Pool Two, as they won 21-16 at Castres. He missed a penalty either side of half-time but re-gathered himself to crucially find the target twice when the pressure was on at the end of this Champions Cup clash. Leinster were trailing 16-15 with five minutes to go but he landed one kick to give them the lead and when he was handed another chance with just a couple of minutes to go, he found the target again even though he didn’t start his run-up until referee Greg Garner had said “ten seconds to go” – making sure he used up the whole minute allowed for the penalty so only a few seconds remained on the clock. Honourable mentions also go to a trio of players who hit the 20-point mark in their European Challenge Cup matches this weekend: Gloucester’s Greig Laidlaw, Edinburgh’s Tom Heathcote and Bordeaux- Begles’s Pierre Bernard. 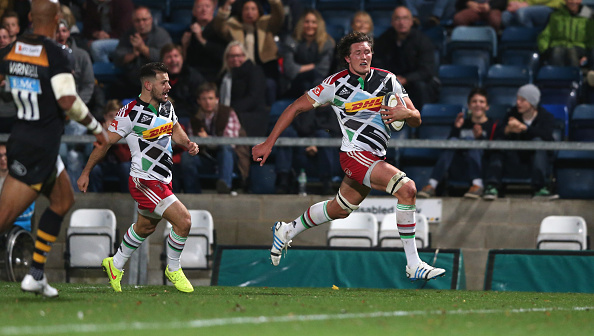 The Man of the Match in Harlequins’ 23-16 win at Wasps in the Champions Cup was lock Charlie Matthews. He popped up on the left wing to sprint in for a try after 37 minutes, which took Quins from 10-6 down to 13-10 up at the break. He had already had a try disallowed at that stage, when he was held up over the line. As a second row, Matthews also played a key role in the Harlequins scrum, which turned the screw on the strong Wasps eight as the match went on and earned a penalty try in the 64th minute, ultimately sealing the win. Whatever aggrieved fans and coaches may think, most refereeing in professional rugby is extremely good and occasionally an official will show that extra bit of empathy or sheer common sense which deserves a mention. Greg Garner caught my eye, or ear, this weekend as he spoke to the Castres players in French when he could. It annoys me no end that French teams almost always have to deal with referees who speak only English, when they are playing opponents from the British Isles. I know there are plenty of English-speaking overseas players at French clubs, but there are also a lot of natives and it doesn’t take much for referees to learn just a few key phrases in French, to make their commands clearer. John Lacey, the referee of Scarlets v Leicester, also did everyone a favour when he told the Welsh side to “kick it out please” to end the game when a brawl was brewing after the 80-minute mark. He defused the situation nicely. A 50-metre try, with a difference! Props will always tell you their tries were scored from 50-metres out and in David Kilcoyne’s case it was almost true this week, but not in the way you might expect. The Munster prop came on as a substitute in the 60th minute of their match against Saracens, just as a lineout was forming in an attacking position on the right. He raced down the touchline from the bench to take his place in the line, and a few seconds later he was being driven over by his team-mates for a decisive try which took Munster from 6-3 up to 11-3 up. They went on to win 14-3 and Kilcoyne had a second try in successive games to celebrate. 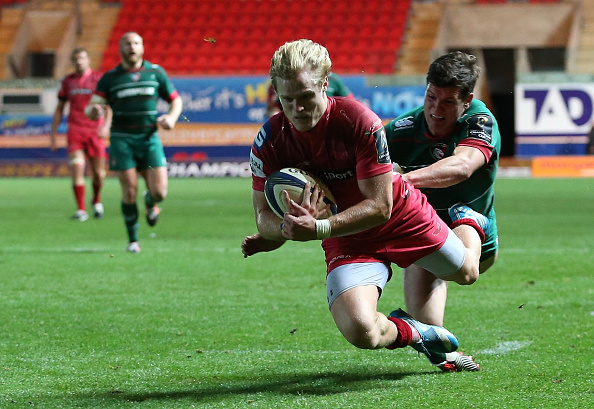 Leicester handed the Scarlets two tries with shocking errors and wasted a scoring chance of their own in the same way, as they crashed to a 15-3 defeat at Parc y Scarlets. With just eight minutes gone, centre Anthony Allen dropped the ball with the line totally at his mercy, denying the Tigers the first score of the game. Nine minutes later Miles Benjamin fielded a kick in his own 22, but then inexplicably dropped the ball as he tried to run out of defence and Harry Robinson pounced to put the Scarlets ahead. Finally, Ben Youngs allowed himself to be stripped of the ball by Aled Davies with 61 minutes on the clock and the Welsh scrum-half raced from halfway to score a try and seal the win. If you can’t believe Leicester would be so careless, here’s the evidence! Trailing 16-6 with the final quarter approaching in their Champions Cup Pool Three clash with Toulon, Ulster were pressing just outside the 22, looking for a score to bring them back into contention. However, when Nick Williams tried to find Chris Henry with a pass, Delon Armitage intercepted and ran all the way to the Ulster try-line to stretch the visitors’ lead to 23-6. To their credit, Ulster didn’t give up and managed to narrow the gap with a late try from Craig Gilroy, but the reigning European Champions were not going to let a 17-point lead slip in as many minutes. Ulster fans and Williams’s family may not want to click on this link. Saracens’ replacement prop Rhys Gill earned himself a yellow card when he tipped Peter O’Mahony over at a ruck during the Champions Cup clash with Munster. The scores were tied at 3-3 at the time, with 51 minutes on the clock, but in the ten minutes that Sarries were down to 14 men, Munster scored eight points. 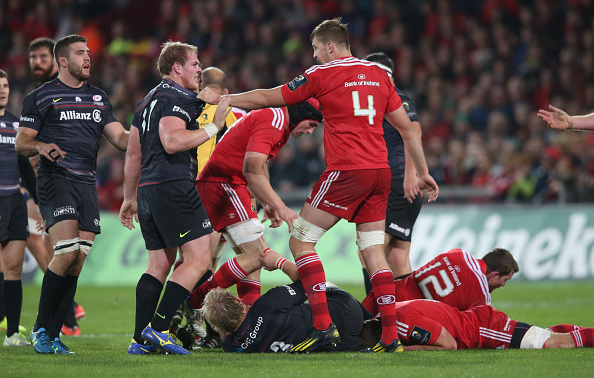 In the context of a tight game, that left the visitors with a mountain to climb at Thomond Park and Munster went on to win. Castres No 8 Piula Faasalele owed his team-mates a few apologies after Saturday’s loss against Leinster as his head-high tackle Jamie Heaslip meant the French side’s 16-15 lead turned into an 18-16 deficit with less than five minutes on the clock as Ian Madigan kicked the resulting penalty. Just when five minutes of discipline and stout defending was needed, Faasalele lost his head – though happily Heaslip didn’t quite lose his. Our final Sinner is Strictly Come Dancing judge Len Goodman, who used his casting vote to eject former Scotland star Thom Evans from the TV show on Sunday evening. Evans was in a dance-off against Simon Webbe from the pop group Blue, and although Evans won favour with two of the four judges, his fate was decided by Goodman, who pointed him in the direction of the door. How could you Len? !